Our work, and our history, is tightly connected with the IWW – the Industrial Workers of the World union. The IWW was among those to first lead a Colorado-wide miners’ strike in the 1920s, which ultimately changed our lives so profoundly. 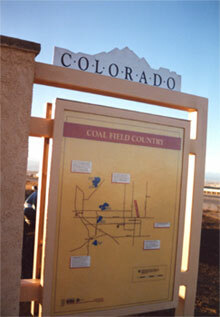 In the early morning of November 21, 1927, coal miners at the Columbine Mine north of Denver, while trying to march in support of their strike were fired upon by state militia. 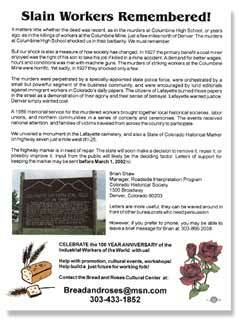 Six were killed, and in 1989 the Colorado IWW, among others dedicated a gravestone and state highway markers to memorialize the miners. • Publish a book with the story of the Columbine strike: Slaughter in Serene: The Columbine Coal Strike Reader. • Show the art of IWW artist Carlos Cortez at various galleries and sites in the Denver/Boulder area. • Sponsor a concert with major national music talent as a trbute to working class triumphs. Join us! These kinds of Cultural Activities are in addition to our work, along with the IWW, in support of the daily struggles of workers locally, nationally and internationally. Yes, we still have a world to win/rescue. 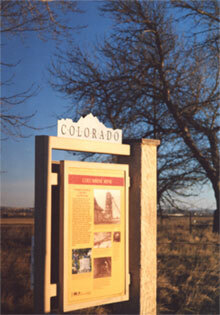 The new memorial located just outside Lafayette Colorado. This replaces the previous memorial of 12 years. 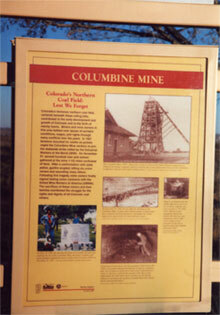 The accompanying pictures note various mine locations, as well as gravesites and strike pictures. Colorado’s immense northern coal field, centered beneath these rolling hills, contributed to the early development and growth of Colorado and to the birth of nearby towns. Miners and mine owners in this area battled over issues of workers’ conditions, wages and rights through many conflicts over the years. 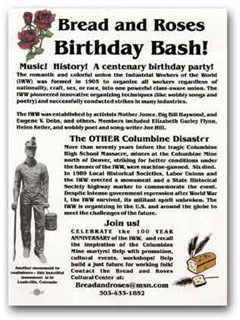 In 1927 tensions mounted for weeks as pickets urged the Columbine Mine workers to join the statewide strike called by the Industrial Workers of the World (IWW). On November 21, several hundred men and women gathered at the mine 1-1/2 miles northwest of here. After a confrontation with state police, gunfire erupted, killing six union miners and wounding many others. Following this tradgedy, mine owners finally signed lasting union contracts with the United Mine Workers of America (UMWA). 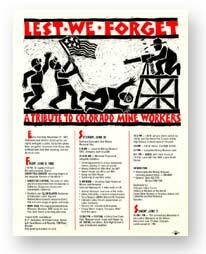 The sacrifices of these miners and their families manifested the struggle for the rights and dignity of all Colorado miners.